HONOLULU – Gov. David Y. Ige today announced the appointment of Catherine Betts as deputy director of the Department of Human Services (DHS) effective October 3, 2017. Betts will assist DHS Director Pankaj Bhanot in leading the department and its more than 2,000 team members, along with the state’s largest departmental budget of $3.3 billion. Betts will also help drive meaningful change in the department’s delivery of human services. She fills the vacancy left by Bridget Holthus who is moving out of state with her family. Betts has led the Hawai‘i State Commission on the Status of Women since December 2011, as the executive director. 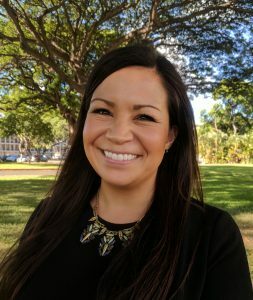 She has been a strong advocate for progressive change for women and their families throughout her tenure, leading campaigns to strengthen Hawai‘i’s equal pay statute, reform police response to domestic violence, increase accessibility to long-acting and emergency contraception and improve paid family and medical leave for workers. The commission is an attached agency of DHS. “Cathy brings an important perspective on the roles social justice and equality play in Hawai‘i residents’ ability to thrive. We are hard at work changing the way we deliver human services to people who need them most. Cathy’s keen understanding of how systems affect people in real ways will take us to a new level of statewide, systems-level change,” said DHS Director Pankaj Bhanot. “I am extremely humbled to be appointed as deputy director and keenly understand my obligations as a public servant to the people of Hawaiʻi – to ensure our most vulnerable and marginalized populations are protected and treated with dignity. I look forward to assisting Director Bhanot in furthering his progressive vision for the department and am very grateful to Gov. Ige for entrusting me with this wonderful opportunity and responsibility to serve the people of Hawaiʻi,” said Betts. Betts previously practiced law in both the private and government sectors. Betts earned a B.A. in sociology from the University of California, Los Angeles and a J.D. from the University of Hawai‘i William S. Richardson School of Law. This position is not subject to Senate confirmation.